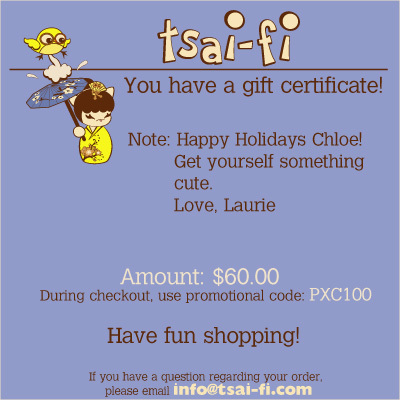 Give the perfect gift - a tsai-fi Gift Certificate! - A link to tsai-fi so they can start shopping! Just enter the recipient's name, the recipient's email and the amount that you would like to give as a gift in the drop down boxes below. Once we get your order, we'll email your recipient an email with the a gift certificate an the code for that amount. Your gift certificate will be sent via email in 24 hours.